This prison sandbox strategy game is now available on mobile and involves escaping from prisons of gradually increasing difficulty as fast as you can. While you are behind the prison walls planning your breakout you need to go about your daily routine which would typically be leaving your cell in the morning to get breakfast, followed by some exercise in the exercise yard and then doing the job you have been assigned which could be anything from working in the laundry to cleaning up the surrounding areas. To begin with you will not want to attract attention to yourself so you go about your daily routine and attend roll-call like a model prisoner. All the while you are doing what is expected of you and staying out of trouble you converse with other prisoners and trade with some of them to get contraband and hard to get items you need for the escape you are planning. Escapes are devised and planned by going to the library and browsing the internet. Your escape plan can be anything from donning a guard uniform to go unnoticed and walk out the prison to crafting a shovel and digging your way out. Just make sure that whatever you plan is you do not get caught by the guards otherwise you end up in solitary and all your contraband is confiscated. What are the Prison Jobs? 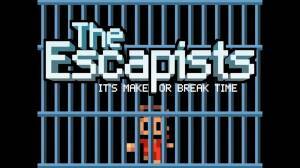 No discussions open for The Escapists at the moment.